This liquor store sign just screams 1960s. 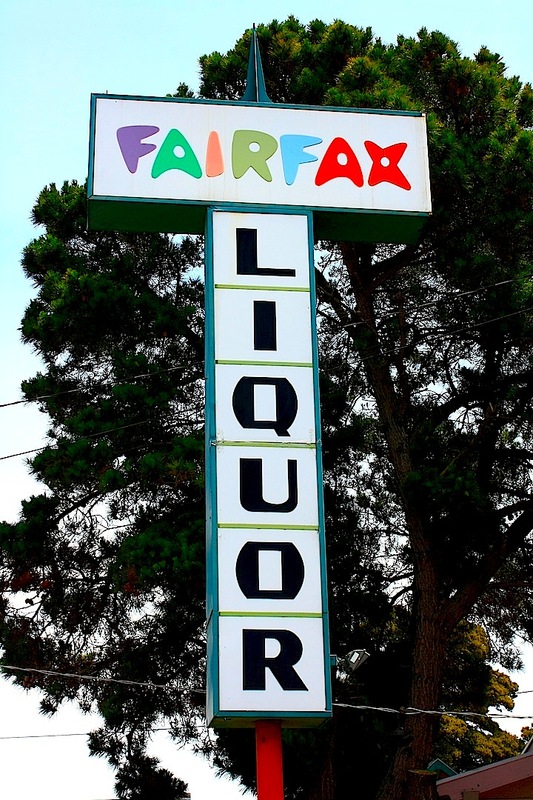 The atomic lettering for Fairfax is too cool. At least I think so. The guys watching me take the pictures were probably wondering what I found so interesting. Found in East Oakland at 54th Avenue and Foothill Blvd. The weather has been intermittently cloudy with some spits of rain. The sun returns today. For other sky views, don't forget to visit Skywatch Friday. Great font on these signs. I agree with you as to the vintage look. That's why I like it so much. Love it! such wonderful graphics. I'm with you 100% on this one. Long live the 60's! Atomic lettering. I had forgotten that term. Way cool. That is a sign from a time warp. It would be a great shot for the Signs, Signs meme! I love the colorful sign. And a very way of free advertising, could easily attract customers.